33 & 35, Jalan TPP 5/4, Seksyen 5, Taman Perindustrian Puchong, 47160 Puchong, Selangor, Malaysia. Inter Packaging System was established in years 2003 with the aim of supply and providing solution to all your packaging needs. Our machines & products are more servicing in most manufacturing industry, packaging & packing Industry, food & beverage industry etc. 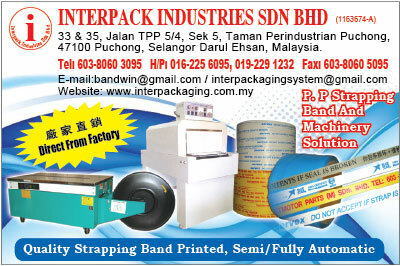 Inter Packaging System supply wide range of strapping machine, shrink tunnel machine, shrink wrapping machine, sealer machine, band sealer, strapping tools & equipment, PP strapping band, stretch film, PVC / POF shrink film, full range of adhesive tapes etc. Inter Packaging System always understand customers needs, we strongly well trained our technician and provide SERVICE & REPAIR all brand of strapping machine to customers. From time to time, Inter Packaging System was growth to an importer & manufacturer of strapping band with printing on the products. We always do our best to supply high quality products and provide the best service to all customers. We strongly believe with our continuously improving products quality, we will meet the ultimate and satisfactions from our clients.